The dental practice was established in Grangemouth in the 1940’s by David Thomson moving to its current location in the 1950’s. The practice has developed over the last 70 years into a custom designed clinic that exists today whilst retaining the exterior appearance of the original Victorian villa. It has had a few names over the years but in 2007 it became The Practice Dental Surgery when the recent extension was opened by Forth Valley Health Board chief executive Ian Mullen MBE. We have been the workplace of many dedicated dentists and staff over the years. At present Craig Yeaman and Crawford MacLean are the current practicing senior partners. 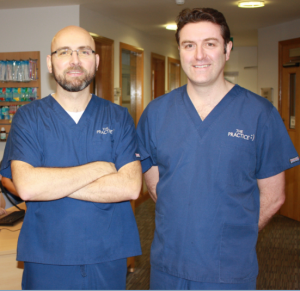 Both partners have a very strong commitment to ensuring The Practice gives the highest standard of patient care. Working alongside the partners is the Practice Manageress, Pauline Laird, who is responsible for the day to day management of The Practice and its 20 staff.